Today I have a special gift for my Facebook fans - a free pattern and tutorial for an Easter basket! Not a facebook fan yet? Don't worry, it is easy to become one! Just click the "Like" button when you get to the page. You can download the free pattern and tutorial here. UPDATE: If you don't use Facebook, you can receive the pattern for free by subscribing to my email updates using the form in the right-hand column of this page. You will receive a link to download the pattern after you confirm your subscription. UPDATE (12/8/14): This pattern is also now available for download on Craftsy (affiliate link). 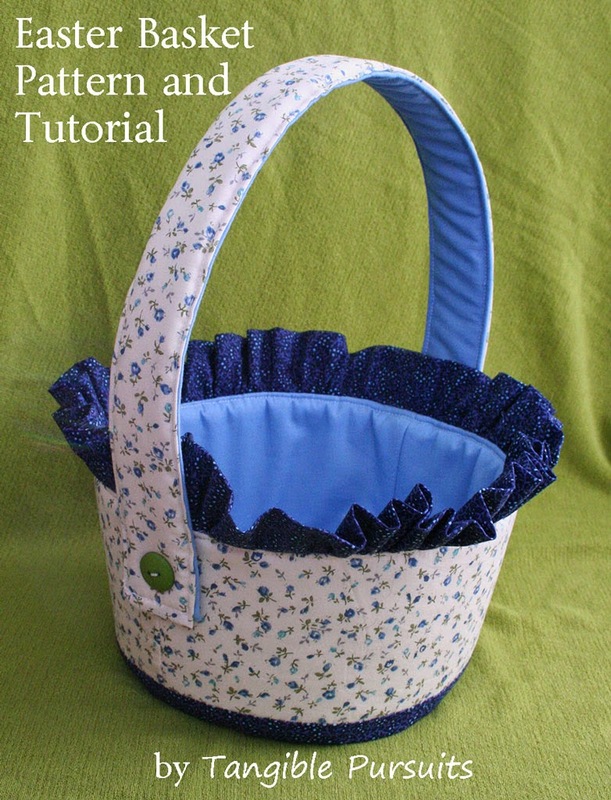 To make the basket you will need three fat quarters (or regular quarter yards, it doesn't matter), two sheets of plastic canvas, some batting (about 1/2 yard) and two buttons. You can use brighter colors than I did for a kids Easter basket. My first attempt at designing this basket was done in much more fun colors. Unfortunately it didn't turn out the way I wanted and I didn't have enough of those fabrics to make another one. But I like this version too. It's just a little more sophisticated. I especially like the button. Adorable, and thanks for the free pattern! I wish I had time to sew a few up, but I pinned it for next year :) great site too, I'm off to look around!! I am in LOVE with this basket! But I am going to make it with out the handle for my Easter dinner table to hold my homemade dinner rolls! Love it! Thanks! I love the idea of leaving off the handle and using it for dinner rolls! wonderful Basket, it ist so sad you want me to go to the evil spying facebook to get the pattern. Whats about craftsy? For people who don't use FB, I have just updated it so that you can also get the pattern by subscribing to my email updates. Use the form in the right-hand column to subscribe and you will get a link to the pattern after you confirm your subscription. Full time professional and full time mom. My day job involves a lot of intangibles, so I like to spend my spare time creating tangible things for my family. You will mostly see sewing projects here, with perhaps some other DIY, gardening, cooking and baking thrown in. If you have any questions, comments or suggestions, feel free to email me at emily (at)tangiblepursuits (dot) com.